Camping is a great alternative if you're a fan of the outdoors or you're not into the B&B or the hotel and motel or beach house rental type accommodations. 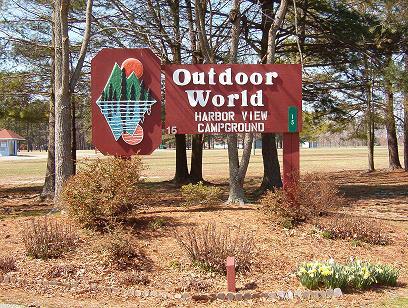 Just bring your tent or RV to one of these great places in or near Colonial Beach! GPS Coordinates: N 38°12'13.43" W 76°58'24.07"
I'm partial to this place because it's right down the street from my house. It is close to Mattox Creek, so there's water nearby. Plus, there's a marina right next door. It's a nice, scenic drive to get to Harbor View, past farms and fields. The terrain is level and easy to navigate. (Lucky for me, because I ride my bike around here a lot!) Nearby there's a restaurant (Bobby K's), hardware store and a thrift/gift shop. You're only about nine miles outside of the actual town part of Colonial Beach, so it's an easy drive to get to all the attractions the area has to offer. 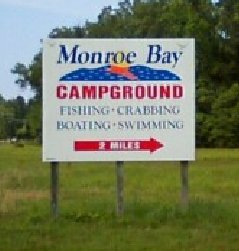 This one is right on beautiful Monroe Bay and is the closest one to the Town of Colonial Beach. 804-224-7445. Near Oak Grove, on the same road as Ingleside Winery, Rock Springs Archery and the former Northern Neck ATV Park. Take Rt. 205 from Colonial Beach to the intersection of Rt. 3. Go straight at the intersection, it's Leedstown Road on the other side. Follow this road for a good while and then look for the signs for Rt. 637 on your right. firewood is sold at the park. Please don't bring any firewood in, this may spread the forest infestation of the emerald ash borer. outlets for 20 and 30 amp current Camping cabins, Fully-equipped Rustic cabins and a waterfront five-bedroom retreat are also available. Amenities: Olympic-sized pool, beach (no swimming), hiking and bike trails, boat ramp, pier fishing, kayak tours, fossil beach. My dogs and I loved to hike here. It's such a beautiful state park and there's so much to see. The ultra-tall Horsehead Cliffs are just breathtaking. The Potomac River views are spectacular. It's not all that far away from Colonial Beach, either. It's straight down Route 3 and the entrance will be on your left.